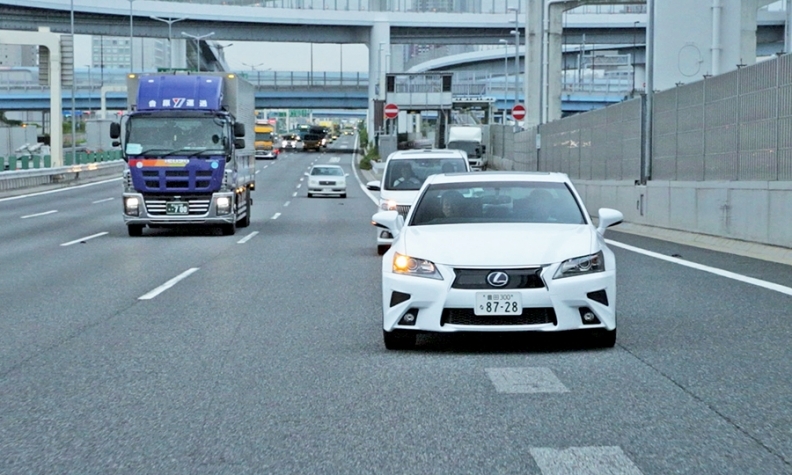 A Lexus GS with Toyota's Mobility Teammate technology merges into highway traffic, above. The driver programs the destination, takes the car to the highway, then flicks a button and sits back. 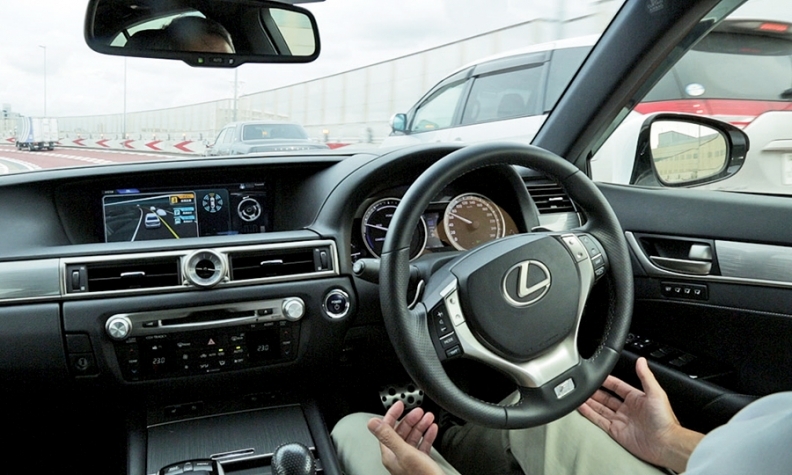 TOKYO -- With the click of a button, our Toyota test driver lets go of the steering wheel and sits back as the white Lexus GS merges onto the crowded Bayshore Route of Tokyo's Shuto Expressway, weaving between cars and changing lanes in an impressive display of autonomous driving. Toyota's name for the technology -- Mobility Teammate, with the emphasis on team -- offers a telling insight into how the automaker aims to differentiate itself from rivals in the coming age of self-driving cars. No hyperbole about driverless convenience, the triumph of super-computer intelligence or the frailty of human judgment. Toyota's vision of the future keeps customers in the driver's seat even if their hands aren't always on the wheel. "Interactions between drivers and cars should mirror those between close friends who share a common purpose, sometimes watching over each other and sometimes helping each other," Toyota says of its Mobility Teammate system. "This approach acknowledges the utility of automated driving technologies while maintaining the fun experience of driving itself." Indeed, its Mobility Teammate logo depicts the silhouette of a human and a robot, each with one hand on a steering wheel. The impulse to keep humans in the equation comes straight from the top. Car-guy CEO Akio Toyoda is an accomplished race driver who has dedicated his tenure to spicing up the brand's cars. He is Toyota's No. 1 believer in making cars fun to drive. In fact, Toyota's tag line in Japan is: "Fun to drive, again." Hence the quandary over autonomous cars: How can they be fun to drive (again) if you just sit there while a computer takes over? Toyota walks that fine line with its teammate concept. "The concept has not changed, but our way of explanation has changed," said Ken Koibuchi, general manager in charge of Toyota's autonomous driving program. "How much would be done by automated driving became unclear. So we tried to describe two things in one word. People and the vehicle are teammates." In practice, though, Toyota's prototype system leaves little for the driver to do, testament to how far the technology has come. The driver programs the destination into the navigation system and pilots the car, as normal, to the highway on-ramp. As the car passes through the automatic tollbooth, the autonomous drive function switches into "ready" mode. That's when our driver flicked the button and released his grip. The car immediately slumped in speed, then suddenly rebounded with a surge of acceleration and charged into traffic, automatically initiating the blinker and merging. After about five miles, as we were approaching the off-ramp, the car automatically changed lanes again, timing its move to weave between other vehicles in Tokyo's evening rush hour. “Interactions between drivers and cars should mirror those between close friends,” Toyota says. Toyota hopes to deploy the technology around 2020, even though trials on public roads began only in March. Toyota has eight Highway Teammate-modified Lexus GS sedans. Koibuchi's autonomous driving division has 60 engineers in Japan, 20 in North America and 10 in Europe. Plenty of hurdles, including cost and complexity, remain. The system uses six lidar sensors, one enormous stereo camera behind the rearview mirror and two millimeter wave radar sensors, one each in front and back. GPS is a must-have, but the system's biggest limitation is its reliance on ultra-precise mapping. Existing maps simply won't cut it. Toyota's system needs maps so detailed that they reproduce the very size and shape of every lane on the road. In fact, Toyota had to work with an outside mapping company to develop its own maps for this small stretch of Tokyo highway. Without it, the car wouldn't be able to self-drive there. Regardless of when Toyota begins to mainstream the technology, one aspect of its marketing is taking shape: Mobility Teammate shouldn't replace the driver; it should make driving more enjoyable. "The system watches over me. That's more fun," Koibuchi said. "The machine doesn't switch the button to take over from the driver; the driver switches it to hand off to the vehicle."